The late Dale Whillans, of Hawick. A fundraising football tournament held in memory of a Hawick teenager killed by a car crash has raised £1,350 for two good causes. That takes the total raised in Dale Whillans’ name since his death near Jedburgh in April last year at the age of 18 to more than £7,000. Dale's aunt Susan, cousin Emma and mum Val at the tournament. The keen footballer, a player for Hawick Royal Albert, Hawick United and Hawick Legion, died in Edinburgh’s Western General Hospital a few days after the crash a mile west of Cleikemin. Just weeks after his death, his friend Steven Drummond organised a memorial seven-a-side football tournament in Hawick’s Albert Park, raising £6,000, and the event was rerun this month, attracting a turnout of about 350. A total of 160 footballers, many of whom had played alongside Dale, took part. Steven, co-organiser of the tournament with Dale’s cousin Emma Coltman, said: “There was a good atmosphere all day, and we must have had around 350 people attend. 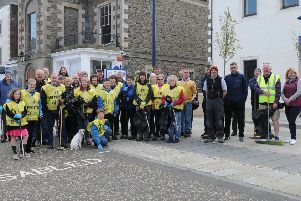 “We raised £1,350, which will be divided between the Scottish Air Ambulance and ward 20 at the Western General Hospital. “The football was very competitive and well contested. “Everyone was trying really hard, and a lot of people came along who had not been able to make last year’s event. “I think Dale would have been impressed at the standard of the football and the effort everyone was putting in. There was something for all the family on the day, from 11am to 5pm, with attractions including face-painting, a bouncy castle and burger van. The evening ended with a disco. Among the raffle prizes donated were signed footballs from Manchester United and Rangers football clubs, and on the day the town’s Morrisons and Sainsbury’s stores provided fruit and water for the players. Steven added: “Staging the memorial match is very important for the family. “It’s all about remembering Dale, and it means a lot to the family that so many people turn out, and we’re already looking forward to next year. “Dale was the best young footballer I remember seeing. He played in midfield, and he really did have a great footballing brain and also great determination on the pitch. After a series of rounds, the final was contested between Tati’s Torpedoes and Hawick United A, with the Torpedoes emerging victorious by one goal to nil. Appropriately, that goal was scored by Andrew McFarlane, who had played with Dale when both were members of Hawick Legion. Aidan Reilly, of Tati’s, was named as player of the tournament.